New in v0.45, removed in v0.46. Use batch export option in Esporta Bitmap dialog. Just one effect exists for this category. Exports Gruppi to PNG files. A PNG will be produced for each group. The PNG will include all objects within the quadro delimitatore of the group. File names are derived from Gruppo Id names. An option to limit the export to Livelli can be chosen in the effect dialog (recall that Livelli are just Gruppi with a Inkscape specific attribute). 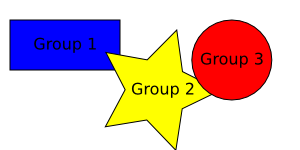 Three groups have been defined: each containing a regular object and a text object. The three exported groups as PNGs. Gruppi can be given meaningful names using the Object Properties dialog (Oggetto → Proprietà Oggetto... (Shift+Ctrl+O)).